Left: Williamsburg Bridge near completion 1903. Right: Williamsburg waterfront 1895. Here's a quick history of Williamsburg, Brooklyn. My how you've changed! In 1638, the Dutch West India Company first stole the area's land from the local Native Americans. In 1661, the company chartered the Town of Boswijck, including land that would later become Williamsburg. After the English takeover of New Netherland in 1664, the town's name was anglicized to Bushwick. During its earliest days, Williamsburg was known as Bushwick or Bushwick Shore. Local farmers would gather near what is present day Grand Street to market their produce, leading to a number of other farm developments in the area. Eventually a developer named Jonathan Williams acquired land along what is now Metropolitan Avenue, and in 1802 renamed that area Williamsburgh in honor of himself. Incorporation soon followed, as did the development of a post office, fire station and numerous shipyards. Williamsburgh’s location on the East River made it a major shipping hub, and resulted in numerous factories expanding there. Due to its expansive growth, it officially separated from the town of Bushwick in 1840, and dropped the “h” from the end of its name to become simply Williamsburg. In 1855, Williamsburg was officially annexed into the city of Brooklyn, becoming a part of that city’s Eastern District. It would later become a part of New York City in 1898, when Brooklyn became one of the Big Apple’s five boroughs. With the building of the Williamsburg Bridge in 1903, thousands of Lower East Side residents who were living in tenements crossed the river to a better life in Williamsburg. Immigrants began arriving in Williamsburg around the beginning of the 20th Century. Many of these immigrants were from Europe, and primarily settled in the town’s north side. Williamsburg grew so fast from 1900 to 1920 that it became the most densely populated are in all of New York City by 1917. New housing projects sprang up throughout Williamsburg to handle the influx of people who were now calling Williamsburg their home. LEFT: Humboldt Street south of Conselyea Street, 1923. 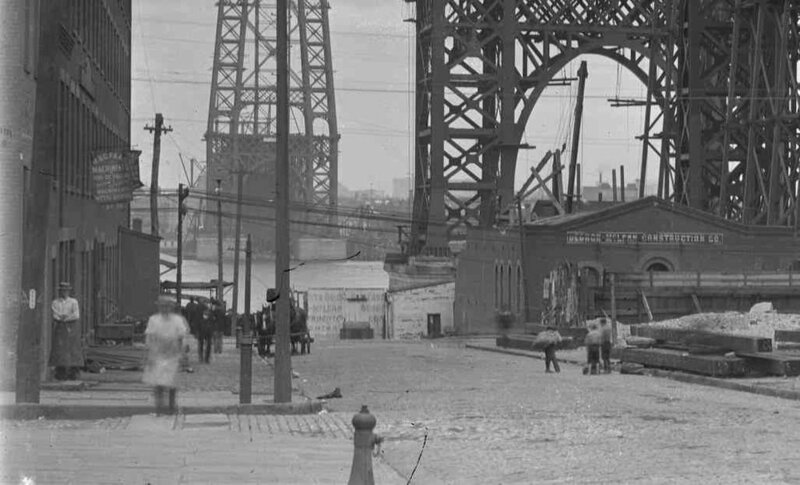 RIGHT: Base of Williamsburg Bridge, 1899. In the 1960s, thousands of Puerto Ricans came to Williamsburg attracted by the abundance of factory jobs. Through the 1980s, the Hispanic community grew, with the arrival of Dominicans and other Latin Americans. In 1961, Williamsburg had 93,000 manufacturing jobs; by the 1990s, the number had decreased to less than 12,000. The decline in manufacturing left thousands of Hispanics unemployed. These events would intensify mounting social ills such as poverty, racism, poor health care and inadequate education, which are still in the process of healing. Some of the largest industrial firms in the nation grew here, such as Pfizer Pharmaceuticals (1849), Astral Oil (later Standard Oil), Brooklyn Flint Glass (later Corning Ware) and the Havemeyer and Elder sugar refinery (later Amstar and Domino), as well as D. Appleton & Company, U.S. publisher of Alice in Wonderland and Charles Darwin's The Origin of Species. Breweries such as Schaefer, Rheingold and Schlitz, docks, shipyards, refineries, mills and foundries opened along the waterfront. In 1851, the Williamsburgh Savings Bank, the Williamsburgh Dispensary, the Division Avenue ferry and three new churches were established. During the last twenty years, Williamsburg has become home to a new set of "immigrants." First, artists moved in for the low rents and huge lofts In former factories, joining already established Italian and Polish immigrants. Galleries, restaurants and shops opened, catering to these new residents. For the last 10 years, Williamsburg has been a real estate boom. So much building. Local gems have closed in favor of corporate chains because of high rents. But, the neighborhood still retains much of its hipster cred and charm due to its residents and lack of office buildings. Be sure to check out the waterfront which is one of the benefits of the real estate boom! And who knows, maybe in a few years we will get the above ground light rail that runs along the waterfront! Check out and support the BQX Connector here. Williamsburg is a neighborhood of 200,000 inhabitants. A mecca for young creatives for over a decade. Interestingly, the hip Williamsburg scene plays out against a backdrop of old industrial buildings and a long-standing residential community of Hasidim. Williamsburg used to be populated primarily by artists and immigrants. It is now mostly gentrified with spillover from Manhattan, however it is an influential hub for fashion, music, art, food and of course hipster culture. Geographically: Greenpoint, Brooklyn is to the north, Bedford–Stuyvesant to the south, Bushwick and Ridgewood, Queens to the east and the East River to the west. It connects with the Lower East Side in Manhattan via the Williamsburg Bridge and 14th street via the L subway line. Bedford Avenue is home to many of the neighborhood’s great restaurants and boutiques. If you want to spend some time shopping for local-made and artisanal goods, this is your street. Bedford Avenue is the longest street in Brooklyn. The longest street in all of New York City? It’s Broadway. Bedford stretches 10 miles (16 km) and 132 blocks. There are two New York City Subway stations named after the avenue: the Bedford Avenue (L train) station and the Bedford–Nostrand Avenues (G train) station in Bedford-Stuy. Bedford Avenue passes through neighborhoods representative of Brooklyn's famous cultural and ethnic diversity. African-American, Hasidic, Hispanic, Russian, and Polish neighborhoods are all found along the avenue. in the 70s and 80s, with the decline of industry and the increase of population and poverty, crime and illegal drugs, Williamsburg became a cauldron of pent-up energies. Those who were able to move out did, and the area became known for its crime and other social problems. Al Pacino played Serpico in blockbuster movie and on February 3, 1971, at 10:42 p.m., this is where police officer Frank Serpico was shot during a drug bust, during a stakeout. It exposed widespread police corruption. 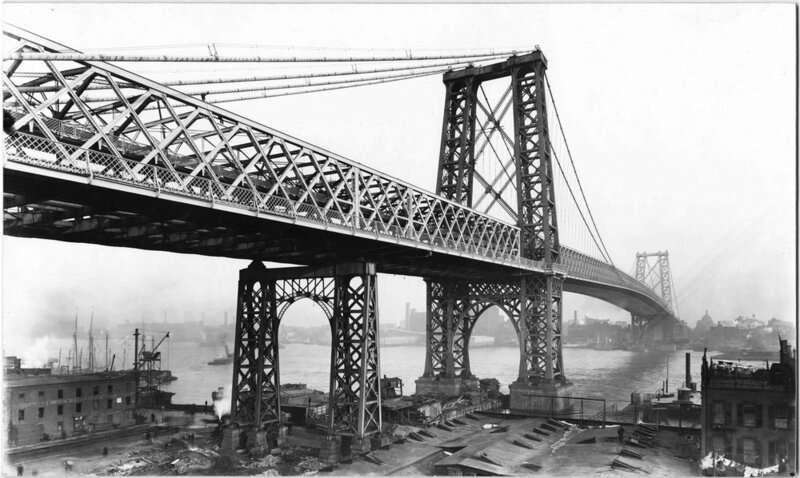 The Williamsburg Bridge took 7 years to complete and was opened in 1903. It was the longest suspension bridge on Earth at the time. It carries subway, auto, pedestrian and bike traffic. There were once two sets of trolley tracks.… and it’s pink! After it opened, immigrants fled the LES tenements and slums and Williamsburg became the most densely populated neighborhood in NYC which was the most densely populated city in the US. But years later, in the 70s and 80s, with the decline of industry and the increase of population and poverty, crime and illegal drugs, Williamsburg was a bad neighborhood. The Domino Sugar Refinery was built in 1882, and it was the largest sugar refinery in the world. In 1917, while producing sugar for the Allies, an explosion destroyed part of the plant, killing several workers. A crowd of more than 15,000 people gathered to watch the plant burn. There was serious concern that the explosion was the work of German agents. Refining operations stopped in 2004, and as of 2012, the property is slated for multi-use development. Several of the buildings in the complex were given landmark status in 2007. TWO TREES is the developer on the 1.5 Billion dollar project. It will take 15 years to complete. It will be a mini-neighborhood with 2,284 apartments and 600,000 square feet of office space. The developer has given use of the BMX and surrounding park until it takes it over for construction. Also, some of the older buildings in Williamsburg spell Williamsburg ending in “gh”. According to most historical accounts, the “h” was dropped after Williamsburg became consolidated with Brooklyn in April of 1854. Peter Luger has been named the best steakhouse in New York City by Zagat Survey for 28 years in a row. The Brooklyn location was established in 1887 as "Carl Luger's Café, Billiards and Bowling Alley" in the then-predominantly German neighborhood which would shortly thereafter be in the shadow of the Williamsburg Bridge. Famous guests have included James Cagney, Alfred Hitchcock, Robert De Niro, Henry Kissinger, Elizabeth Taylor, Jackie Gleason, Chuck Schumer, Johnny Carson, and Jerry Seinfeld. Tennis Champion Pete Sampras also liked to celebrate wins at the U.S. Open by feasting at Peter Luger's. In 1792, Richard M. Woodhull, hoping to attract New Yorkers to suburban life, purchased land in what is now Williamsburg. He established a horse ferry to and from Manhattan and opened a tavern. In 1800, he named the area Williamsburgh. During the 1830s, Irish, German and Austrian capitalists established their businesses and homes herea, and it became a fashionable resort that attracted such notables as Commodore Vanderbilt, Williams Whitney and railroad magnate James Fisk. Through the years, Williamsburg was populated mostly by Hassidic Jews, first generation Italians, and Puerto Rican immigrants. Williamsburg became the neighborhood of artists and recent college graduates in the early 1990s. Thanks to their influence, the neighborhood has become one of the most popular in Brooklyn, with excellent restaurants, bars, and shopping. Industrial lofts have been renovated and converted into gorgeous apartments, and gigantic condominiums have popped up, reshaping Williamsburg from the new East Village to the new SoHo. Fillmore Place: It’s the first Landmark Historic District in Williamsburg. Two real estate investors created Fillmore Place and all the buildings you see in 1840-1850. The most famous resident to have lived within the Fillmore Place Historic District is author Henry Miller who described Fillmore Place in his novel The Tropic of Capricorn continues to reflect many people’s sentiment of the little block: “[it was] the most enchanting street I have ever seen in all my life. It was the ideal street—for a boy, a lover, a maniac, a drunkard, a crook, a lecher, a thug, an astronomer, a musician, a poet, a tailor, a shoemaker, a politician.” Fillmore is like walking into a another world - the narrow street is lined on both sides with 1850s brick row houses, all constructed as a single development. More info here. Fillmore Place Street Art Murals: Completed in May 2015, this piece was done by Tristan Eaton and twin brothers How & Nosm. How and Nosm are twin brothers, born in Spain, German heritage and currently living in New York. Each brother starts on opposite ends and they don’t tell each other what they are doing – until they meet in the middle, when the mural is finished. Tristan Eaton and How Nosm collaborating on a mural together in Brooklyn - Tristan Easton said in May 2015: Four years after How, Nosm and I first painted this wall we revisited our collaboration one more time. Interestingly, the little rectangular window you see towards the left, that used to be Tristan Eaton's studio for a long time but the rent became too high so he left. CHURCH ON BEDFORD NEAR MCCARREN PARK: The Russian Orthodox Cathedral was built in 1922 and is listed in the National Register of Historic Places. It is the only example of its kind of Byzantine Revival architecture in the US. McCarren Park & Pool. The History: Park was created in 1909. The pool was opened in 1936 during the Great Depression as part of a citywide effort to boost morale and provide jobs. It cost $1 million, had a capacity of 6800 simultaneous swimmers and was the size of three Olympic pools combined. It was one of the largest public pools in the world. The pool was closed in 1983 to begin repairs and then the community said no. Residents protested fixing the pool up, citing the petty crime and undesirables it attracted. The pit was abandoned until 2005, when bands like Wilco & Regina Spektor began using it for concerts. Now a $50 million revamp has once again transformed the space into a 1,500-capacity pool. 1834 the village of Brooklyn is incorporated into a city.